Our friends over at Kotaku have gotten the buzz from retailers that, following the recent Wii price drop, Nintendo plans to drive Wii bargains going into the summer season with a new series of software discounts. 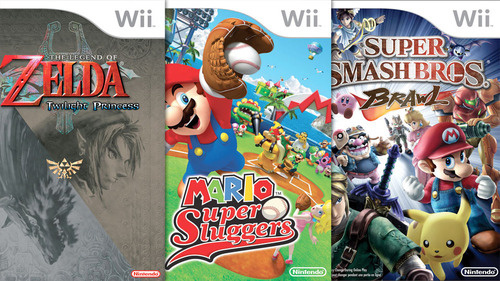 This offer is collectively known as the “Wii Select” line, and is set to include Super Mario Sluggers, Twilight Princess, and Super Smash Bros. Brawl at a new low price of $19.99, similar to the Player’s Choice titles from previous console generations. Wii Sports is also set to follow, divorcing itself from its previous bundled status – reportedly Mario Kart Wii is to replace it at a price of $149.99 for the new bundle. This doesn’t mean much for me directly, as bar Sluggers all of these are sitting on my shelf at home, but considering that all of these games have stayed at $49.99 brand-new since their debut, I’m sure they’ll all see somewhat of a surge in sales. No doubt this is Nintendo’s plan to carry the Wii going into the summer, but does this mean that there’s no software set to hit in the near future? Could this mean that Skyward Sword really isn’t coming until October? Or is there something else up Nintendo’s sleeve to appease Wii owners like me who are wondering where the software has gone? I chose most of these because they’re Nintendo titles that were pretty popular at launch but that despite having essentially dropped off the charts are still priced at $39.99 or more. Technically Wii Sports Resort is still on the charts but it isn’t really selling outside of the current Wii bundle, so I think a price cut could push its standalone sales a bit. I personally haven’t picked it up yet actually, so maybe a price cut will entice me to finally buy it – otherwise my first Wii Motion Plus title will likely be Skyward Sword. Now, of course, this is coming from retailers only and not from Nintendo directly (and they predictably refuse to “comment on rumors and speculation”), but retailers tend to be pretty right about deals for products they’re going to be selling even if they don’t know much about the products themselves.